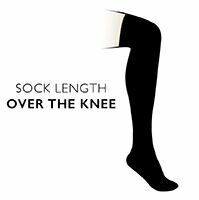 Stay on trend with this pair of classic, cotton-rich over the knee socks. With their hand linked toes for smooth seams for added comfort, they are a great way to keep fashionable while keeping your feet in tip top condition. The cotton rich fabric ensures feet stay fresh and cool, making them stylish and practical for everyday wear.